Pasta is big in my family and there are so many ways to enjoy it. There is a variety of shape to choose from, and the recipes that you can create with them are endless. 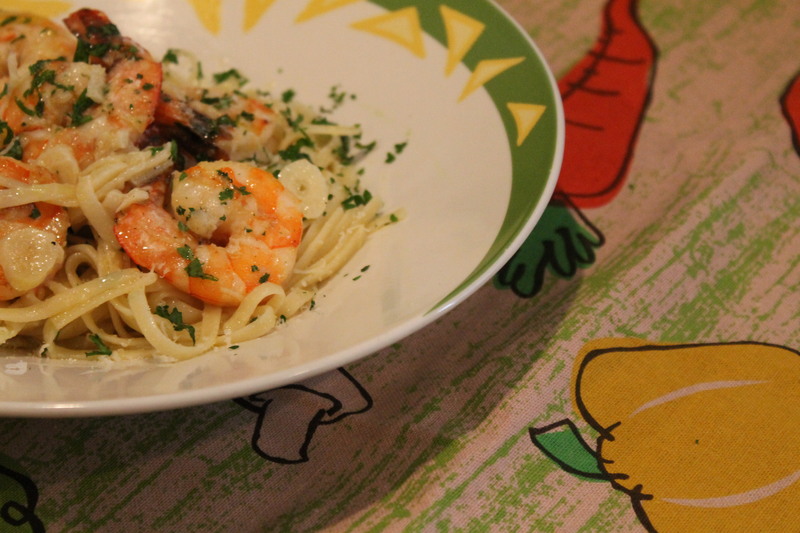 Today, I would love to share with you my Shrimp Scampi recipe, it is easy and delicious. You can use any size shrimp for this dish. 1) In a large pot, bring water to a boil, and add desired amount of salt. Drop the Linguine and cook according to package direction. There is NO need to add oil to the water, IF you’re going to stand there and give it a good stir once in a while. This will prevent the pasta from sticking together. I prefer al dente, it literally means, to the tooth. It’s when the pasta is cooked on the outside but firm on the core. You get this result by reducing the cooking time by 1-2 minutes. Use the package directions as a guideline. I recommend this method because the pasta will cook again in the Shrimp. 2) While the pasta is cooking, season shrimp with salt and pepper. Over medium-high heat, in a large frying pan, heat the oil and 2 tbsp. butter, sauté shrimp for about 3-4 minutes on one side, turn them, add the garlic, and sauté for another 1-2 minutes. Those are extra-large shrimp and need more cooking time, for smaller shrimp, cut the cooking time, otherwise, they will become overcooked and rubbery. Shrimp are considered cooked when they become opaque, and obtain a nice pink/orange color. 3) Deglaze with the wine and lemon, simmer for about 2-3 minutes. Swirl in more butter for a creamy texture, and to add richness to the dish. 4) Drain the pasta (save some pasta water) and pour it in the shrimp, mix well. If you feel like the pasta is too dry, add 1/4 cup of pasta water. This step may not be necessary, please use your judgement as to the consistency you’re looking for. Add a liberal amount of cheese and stir again until it’s melted. I use this method because everyone in my family loves cheese, otherwise, place it on the table. 5) Plate the pasta, garnish with parsley and drizzle with olive oil. You can serve it with a crostini, which is like a garlic bread, to dip in the sauce and wipe your plate clean. At my home, if the plate is not empty, I take it as my food wasn’t good enough. When someone asks for seconds, I know, I have a winner and it feels wonderful. My family devoured this dish, and I hope you will enjoy it as much as they did. It is such a simple recipe, quick and very flavorful. Go ahead, give it a try, you will like it! Wine pairing suggestions: A nice chilled unoaked Chardonnay, Pinot Grigio or a lovely Verdicchio. The choice is yours. Sounds fantastic Gina! I am going to have to make it but will skip the cheese…not a fan of cheese and fish in the same dish! Just a habit… I am really enjoying getting to finally see your recipes in print – I know you’ve been working hard at this for a while. So excited for you! Fabulous Gina! I love scampi! I have found a good gluten-free pasta that allows me to still enjoy my favorites, yee haw 🙂 I can’t wait to make your version – I’m sure it will be outstanding!! Ohhhhh my goodness…… You did it again my dear Gina!! That looks awesome….I can smell the aromas all gathered in this wonderful dish just like if it was in front of me right now. Thank you for awakening all my culinary senses this morning….looking forward to your next art piece….. I love the Sophia’s quote….that woman knows what’s going on ….. Thank you very much! I love Vermentino, what a great choice! Cheers!